Pink and cats. Perhaps my daughter's two favorite things. Imagine her face when she saw these (you don't have to imagine, just look at the photo below)! 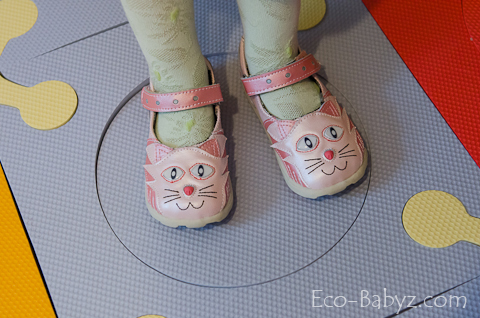 These Fuzz the Kitty mary jane shoes from Zooligans were made for Baby E. At least that's what she thinks. Cats not your child's cup of tea? Do you have a boy? Not a problem, they have the koala, bunny, panda, monkeys, puppies, a gator, and a raccoon to choose from! She cannot wait for cooler weather to wear these, perfect timing since she has just outgrown her last pair of Mary Janes a month ago. There are so many things we love about these! First, that they are adorable of course [and pink] - but that's Baby E's criteria. 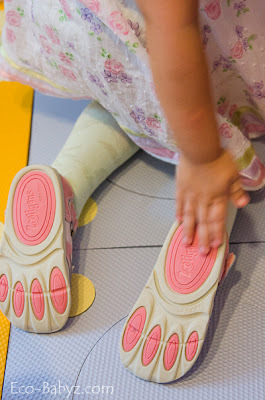 As for me, I love the flexible sole (genius design of a paw) and that they look comfortable and healthy for foot development with a roomy toe box. I love that they are easy for Baby E to put on and take off on her own, a must with her little brother in tow. Love that they are made of long-lasting real leather. Perhaps the only thing I'm not crazy about is the inside of the shoe, not a fan of the synthetic material [cue Zooligans creators taking notes]. Other than that, they are awesome! What kid wouldn't love some animal shoes?! Super comfy ones? Yes, please! I was pretty excited to learn that Zooligans is based in my own state of Massachusetts and their offices are a short drive from where I live. You can definitely see where this fabulous design idea comes from considering they are created by a longtime children's shoe designer and former toy designer, a nice blend of experience. I can't wait to see what Zooligans has in store for future designs! Hm, lions, tigers? Bears? Oh, my! Zooligans shoes retail for $44.95 a pair and are available on websites like Nordstrom and Amazon, among others. Not a cheap pair of shoes and they certainly don't look like one. One of you will win a pair of Zooligans for your little one! My favorite is Sparky the Puppy. I love Bonnie the Bunny. I love Amanda the Panda! I think I like the Fuzz the Kitty ones best, but I also like the Bonnie the Bunny! I like bobo the monkey! The girls Bob the Monkey is my favorite! I like ringo the raccoon! I would have to say either Joey the koala or Amanda the panda. If I had a son Jacques the gator is amazing too! I love the monkey shoes! My favorite is the Joey the Koala! I really like the Panda. My favorite are the Fuzz the Kitty Girls' Mary Jane Pale Pink/Coral. I like the BoBo the Monkey. Oh I love Jacques the Gator! So cute! I love Ringo the Raccoon. My favorite is Sparky the Puppy! Fuzz the Kitten would be Lu's favorite but the bunny teeth are super cute! Bobo the monkey shoes are just darling. Love sparky the puppy in boy; so cute! They are all so cute but I think Amanda the Panda is my favorite! I just realized the tweet read for a different giveaway. Letting you know in case you wanted to change it. I'll change up my tweets. Thank you Audra! I always keep forgetting to change the tweet when I set up a new giveaway! bobo the Monkey is so cute! I like fuzz the kitty best but the panda ones would go with more outfits. i love the boys' gator sandals! I love the alligator style! Sparky the Puppy for boys or Ringo the Raccoon! Love them all! Fuzz the Kitty Girls' Mary Jane for my baby girl!! My favorite are the Bonnie the Bunny Girls' Mary Jane shoes! I love the boy's BoBo the Monkey. Fuzz the Kitty is adorable!